Although this is a one song deal, look for more things coming up with Olivia Thai. She is currently writing songs for her debut album. This entry was posted in music on June 30, 2009 by Kevin Hsieh - channel APA. With the Laura Ling and Euna Lee situation along with nuke testing, North Korea is getting scrutinized more than ever. In Crossing Heaven’s Border, WIDE ANGLE tells the moving and dramatic stories of North Korean defectors. In China, the defectors’ fate is grim. They must live in hiding, working illegally and with no access to education or medical care. If caught by Chinese authorities, they are repatriated to North Korea, where they face severe punishment: persecution, torture, even execution in prison camps. Only a lucky few reach their ultimate goal: asylum in South Korea. Crossing Heaven’s Border reveals the plight of North Korean defectors from the point of view of intrepid South Korean journalists who risked their lives filming undercover for ten months to capture the haunting stories first-hand. (Similar to Burma VJ) The reporters introduce us to a mother working in China as a tour guide to support her six-year-old son who is sick with cerebral palsy and in dire need of medical attention. And we follow the grueling 10-day journey of a teenage girl and a little boy smuggled overland across China and Laos into Thailand, which accepts North Korean defectors as asylum seekers. This entry was posted in documentary, tv on June 30, 2009 by Kevin Hsieh - channel APA. With the help of Japan, we are another step closer to seeing X-men in reality. Researchers at Toyota and Japan’s Riken have developed a brain-control system for a wheelchair. The system analyzes thought patterns and translates them into wheelchair movement in a fraction of a second. The brain controlled wheelchair video reminds us of Professor X from X-men. Speaking of X-men, if you are in the NYC area, be sure to check out the Asian American Comic-con. This entry was posted in technology on June 30, 2009 by Kevin Hsieh - channel APA. By now, you must have heard “Girls on the Dance Floor” by Far East Movement. It’s spinning everywhere. 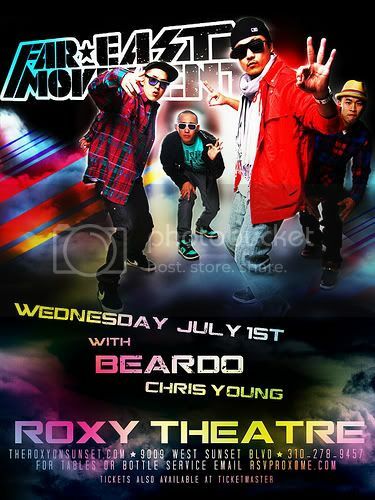 Well, if you’re in the Los Angeles area, the Far East Movement has a concert at the ROXY. Unlike all of their club shows and past performances, this will be a full concert show from the Far East Movement. They’ll be performing songs off our Animal Album along with surprise guests and giveaways. The awesome thing about this show… ITS ALL AGES. If you have never been to an FM concert, you’re in for a treat. They’ll be using a space theme like they did for the Map the Soul Tour with Epik High. Tickets are still available. You can get them here. This entry was posted in events, los angeles, music on June 30, 2009 by Kevin Hsieh - channel APA. I Got Next is a free documentary on the fighting video game scene created by Ian Cofino. It originally started as a senior project at Purchase College, School of Art and Design, and has grown into something much bigger thanks to the dedicated and passionate players in the community. The film features video game champion Justin Wong, with appearances by familiar faces in the gamer community such as James Chen and Ed Ma. It follows some of the regional Street Fighter 4 tournaments in the past year such as Sinsation Fight Club and Final Round XII. Originally envisioned as a short documentary, I Got Next has grown into a feature length production, which will see two releases, a short cut in the summer of 2009 (you can see it below) and a longer cut in the winter of 2009. This entry was posted in documentary, movies, videogames on June 29, 2009 by Kevin Hsieh - channel APA. This entry was posted in music on June 29, 2009 by Kevin Hsieh - channel APA.